I just read that and had to laugh, a smart mini plug and they complain about a charging port that would add size and complexity... cheez, what a weak complaint. Great minds think alike I wonder how many stars they knocked off for that weak complaint..
You lose a power receptacle when using these smart wifi plugs, so adding a 2.1A USB port would be convenient. What these plugs don't do, is individually control the power to the USB port which would be very nice. I've only seen that occur on the Smart WiFi Power Strips. I'm not missing the point. I'm explaining why they reviewed it that way. I like the mini the way it is. I have several around the house and they work and are convenient. Maybe anker isn’t anker without a USB port attached to everything . He mentions HomeKit like 7 times. I have Apple phone and and HomeKit is just a dusty button on the swipe left hidden bottom screen. Dusty. Alexa is way more diverse. USB ports are getting more and more common, handy and needed. What I like best about this plug is that it does not need a hub. 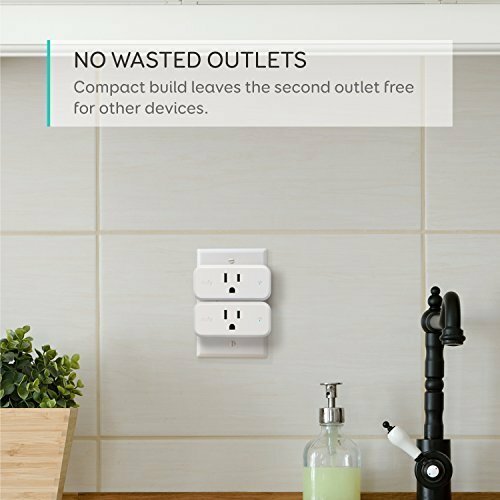 I have other older smart plugs like the Insteon version and it requires a hub to be on all the time to control all the devices. This does not need a hub. You just need an app on your phone to set it up. Even without the app you can still turn it on and off with the power button. You can get the Alexa skill and easily give it voice commands with alexa or Eufy Genie. So far I really like this thing.